This is what a super typhoon likes like from a satellite. Yes, this a pretty intense storm to say the least, and it’s happening right now. NASA reports that super typhoon Jelawat began as a tropical depression over the western Pacific Ocean on September 20. 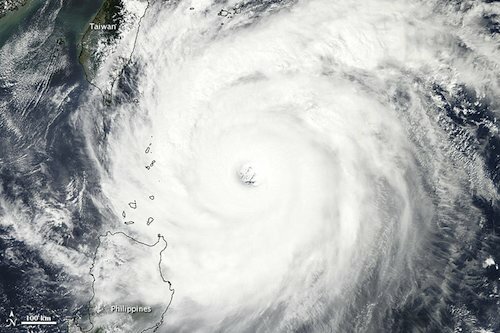 The next day it evolved into a tropical storm, and then strengthened into a typhoon on September 23. By September 24 (bottom image), the storm was about 410 nautical miles (760 kilometers) east of Manila in the Philippines. At that stage Jelawat was packing winds of 130 knots (240 kilometers per hour), with wind gusts well above that at 160 knots (295 kilometers per hour). 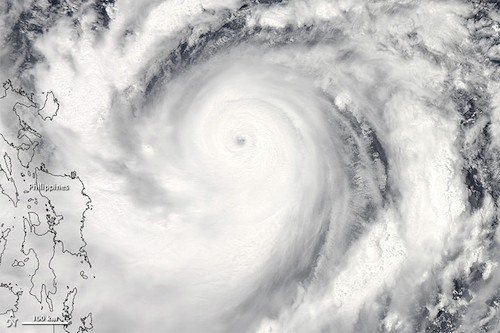 On September 24, Jelawat was classified as a super typhoon. The storm moved north-northwest, coming close to the island of Taiwan, but then turning to the northeast. 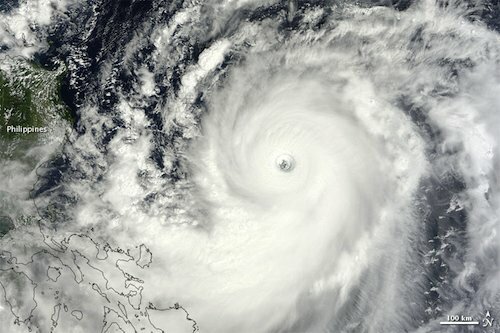 On September 25 (above image) super typhoon Jelawat was around 385 nautical miles east-northeast of Manila and was gusting winds up to 170 knots (315 kilmeters per hour). On September 27 (top, feature image) the massive storm had maximum sustained winds of 135 knots (250 kilmeters per hour), and gusts up to 165 knots (305 kilometers per hour). The projected storm track of super typhoon Jelawat on September 27 had it changing course and heading toward the northeast. According to NASA, the storm was expected to move over Japan in the coming days.